Our group assembled on Saturday morning at The Hirsel, residence of the 15th Earl of Home and his son Lord Dunglass, set in a huge leafy park within their large ancestral estate at Coldstream, in fact just across the border in Scotland. It was a privileged visit for us since it is not open to the public. The house was much extended in Victorian times and indeed a 17-year-old Edwin Lutyens was engaged for its remodelling in 1886. We saw a letter from Lutyens about this and his plans and also a model of a scheme by an unknown architect, though neither scheme was executed. The Hirsel has, in fact, been much reduced latterly, leaving the largely 18th-century structure with a heavily balustraded staircase curiously executed in stone, its exact date not elucidated. We explored the house with its many fine portraits of the family and other notables but, although comfortably furnished, the interiors are not that grand for such a patrician residence. Then it was on to the fine town of Berwick-on-Tweed with its handsome 18th century town hall. The Church of the Holy Trinity there, completed in 1652, is a rare example of a church built during Oliver Cromwell’s Commonwealth. In its added Victorian chancel is an extraordinary creation of 1893 by Lutyens — a reredos comprising gilded Tuscan columns with inlaid floral decoration enclosing an elaborate gilded cross and surmounted by statues of the apostles. But neither the name of the sculptor is known, nor is it revealed who commissioned the work. Afterwards some of us espied the splendid nearby barracks created by Nicholas Hawksmoor between 1717 and 1721, the first built in England. After a copious pub lunch it was on to Holy Island off the coast to visit Lindisfarne Castle, bequeathed to the National Trust in 1944. Edward Hudson, founder of Country Life, had commissioned Lutyens to embellish this small 16th century fort, perched on a rock. The works were completed in 1912 and Gertrude Jekyll created a walled garden nearby. Now the subject of an ambitious, costly restoration project by The National Trust, the castle is spectacularly covered in scaffolding, so this proved largely an archaeological visit since the building was under wraps and its furniture removed. That said, we were efficiently guided by Nick Lewis, the National Trust person responsible for the project. Some of us recalled that Roman Polanski used Lindisfarne, both castle and island, as locations for Cul-de-Sac, his chilling film of 1966. Incidentally, an excellent account of Lindisfarne by Clive Aslet, published in Country Life on 11 July, 2014 can be found on the internet, while Pinterest features views of the castle and its furnished rooms. Lutyens also designed the Lindisfarne war memorial, one of 15 war crosses he created in England. Then, on Sunday, we visited the attractive village of Whalton with its 18th-century stone cottages with stone-slab roofs. Both Sir Robert Lorimer and Lutyens were engaged at different times by Mrs Eustace Smith, widow of a shipping magnate, to transform four cottages into the large residence which became Whalton Manor. Lorimer’s earlier work was relatively modest and it was Lutyens who, from 1908, triumphed with his inventive, complex solutions, all well explained to us by Timothy Norton, who has inherited the house. Lutyens created a new porte-cochère entrance which leads to a sort of stone undercroft with Gibbs surrounds which, in turn, takes you to a low (more recent) dining room with a big fireplace. Upstairs is a splendid classical drawing room with one of MacDonald Gill’s lovely pictorial wind maps (also executed at Lindisfarne). Adjoining this is the fine, circular panelled former dining room. We explored the spacious gardens (to which Gertrude Jekyll contributed) that include Lutyens’s pergola and summerhouses. This particular visit was a definite highlight of the weekend. 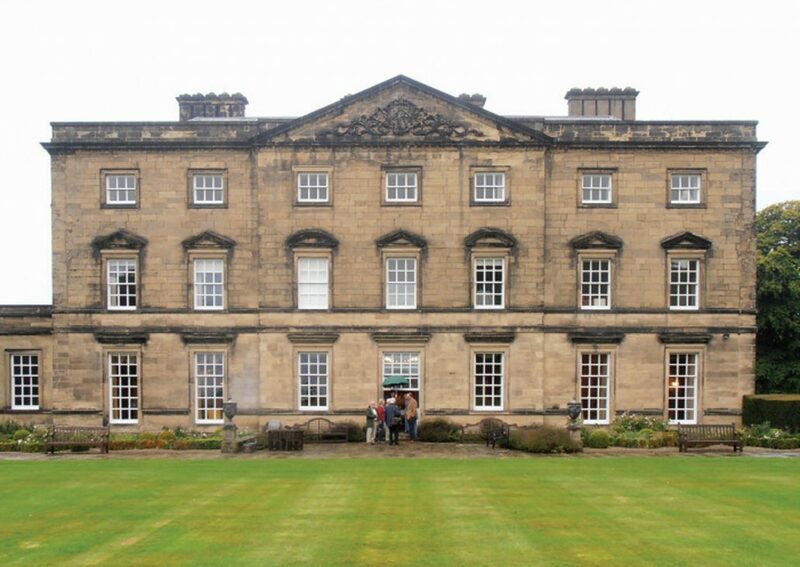 Our next port of call was Angerton Hall, a neo-Tudor house of 1842 designed by John Dobson, also known as the architect of much of Newcastle, though largely in a Classical style, where we were welcomed with elevenses. In 1904, Lutyens and Jekyll created new landscaping and planting for Mr and Mrs Straker, its owners at the time; read these incorporate a characteristic pergola and paved walk adorned by an elaborate wrought-iron gate salvaged from a garden in Weybridge. The Strakers also paid for a Lutyens war memorial cross in nearby Hartburn, inaugurated in 1921. After yet another copious pub lunch, our last visit was to Blagdon Hall where we were welcomed by Lord Ridley and his wife, Anya. This attractive seven-bay Georgian house of between about 1730 and 1752 — architect unknown — was extended by James Wyatt, also responsible for the impressive stable block, and later John Dobson added the north wing. Following a fire in 1944 the house was reduced in size and Robert Lutyens gave it a new correctly Classical entrance portico that faces a rond-point with a Coade stone urn. He also designed the library — now full of Lutyens memorabilia, including a portrait of him by Augustus John and a recently discovered Lutyens sketchbook from when he was 10. 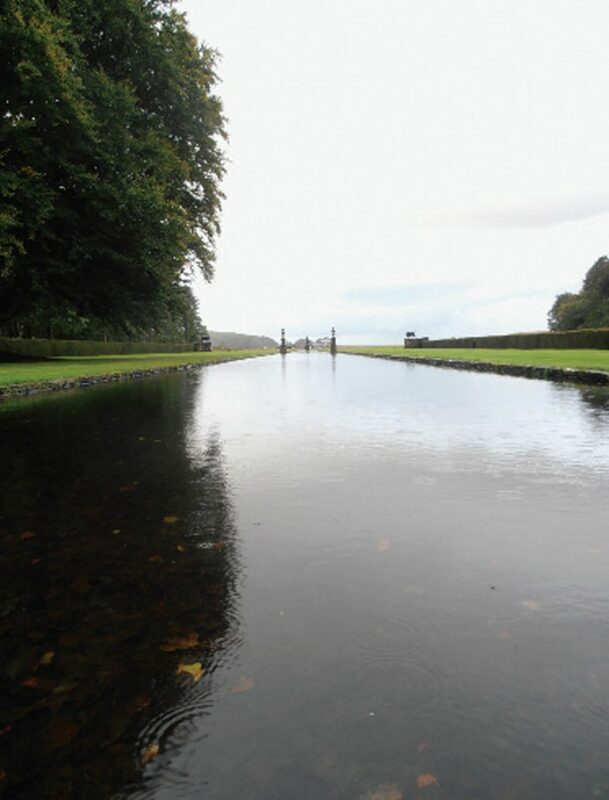 Lutyens’s daughter Ursula married the third Viscount Ridley and her father created its splendid canal stretching away from the south front, completed in 1938 — as well as the characteristic Lime Walk. The reception rooms with their family portraits are adorned by Wyatt-period plasterwork, possibly by Italian stuccatori and good chimneypieces. The entrance hall was recently redesigned with an inlaid parquet floor incorporating a bull, the Ridley crest. This visit was the other main highlight of our tour and we all dispersed well satisfied with our weekend devised by Paul Waite and Rebecca Lilley.